Right throughout qualifying the skies were threatening to open above the circuit. But aside from a brief period in Q2 it never really amounted to more than a few spots. At the end of the session, Hamilton topped proceedings with his 82nd career pole with Vettel second but a series of incidents in Q2 put a bit of a question mark over things. Hamilton had a clumsy few minutes, almost causing a massive accident with Sergey Sirotkin and then having a bit of brain fade while getting out of the way of Kimi Raikkonen. However, with Sirotkin not on a fast lap at the time and Raikkonen not really losing anything, chances are he’ll get away with things. 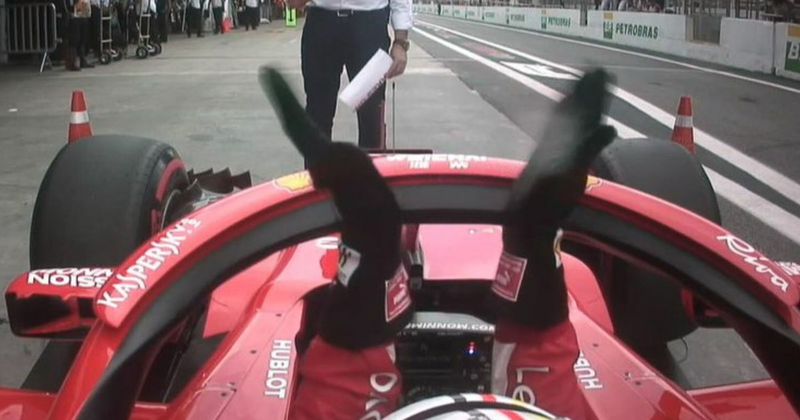 Vettel, on the other hand, is a different story. The rain was at its most threatening at the start of Q2. Everybody went out on track straight away to try and get a time in, but Ferrari took a bit of a strategy gamble. After the outlap, both drivers were called in to switch to the slightly slower softer tyre in a bid to get through Q2 on those and have an advantage for the race. Kimi made the switch fine, but Vettel was a bit unlucky – he was randomly selected for the weighbridge. With time of the essence, an impatient Vettel hurried the process along, knocking a cone out of the way and then ignoring procedure as he was being weighed as he left his engine running. Then he pulled away under his own power – also a no-no. That broke the scales and earned him a trip to the stewards. You can understand his frustrations as being chosen for the weighbridge in such unpredictable conditions could have been the difference between getting through Q2 and getting knocked out. As it is, his impatience could prove even more costly. Outside of the top two, Valtteri Bottas took third with Kimi Raikkonen fourth ahead of both Red Bulls, Max Verstappen fifth and Daniel Ricciardo sixth (though Ricciardo with drop five places thanks to a power unit penalty). Best of the rest is a slightly surprising name as the one and only Marcus Ericsson made the most of a strong Sauber to outqualify Charles Leclerc by almost two tenths – a reasonably big gap on what is such a short circuit. With Ricciardo’s penalty he’ll start sixth – the best grid position of his career, two races before it comes to an apparent end. Hamilton incident aside, another driver who had a good session was Sirotkin, who edged through to Q2 after putting in a stonking lap in Q3 while everyone else was busy wondering if the track had become too wet. The race is set up nicely as Ferrari strategy gamble actually worked. Starting on the softs as opposed to the supersofts could be a big advantage over the Mercedes and Red Bulls. The problem is that Vettel might have already thrown his advantage away. Then again, the race could be wet, and none of it could matter.